Franklin County Public Health believes that all children and members of their communities should have access to safe, affordable, healthy and nutritious foods to achieve optimal health. Creating healthy communities is not just about changing individual behaviors, it is also about changing the environment in which people live, work, learn and play. This vision fosters a fair and sustainable food system that not only increases access to food but enables people to make informed choices about available food options. 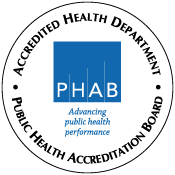 Franklin County Public Health and its partners are working towards creating a unified food system by strategizing and implementing evidence-based strategies. Local foods are purchased, promoted and served in the cafeteria, as a snack or in classroom taste-tests. Ohio Days: My Plate, My State is Central Ohio’s procurement program. This program features one meal a month that is entirely grown, raised and/or processed in Ohio. Visit our Ohio Days (hyperlink) page to learn more about the program and how to become involved. Students participate in education activities related to agriculture, food, health and nutrition. This learning can take place in the classroom, cafeteria or garden. Students learn agricultural, food system and nutrition education. They learn about where their food comes from, how it is grown and the knowledge to make improved nutrition choices. Students engage in hands-on, experiential learning through gardening. Gardening can take place as seedlings in the classroom, raised beds on school grounds, a community garden or even through tower gardening. Each of these three components aids in children trying healthy local foods, learning about those foods and gaining the skills and knowledge to grow their own. In turn this increases children’s confidence and develops critical thinking skills by becoming more informed food consumers while also combating the increasing rates of childhood obesity and chronic disease. 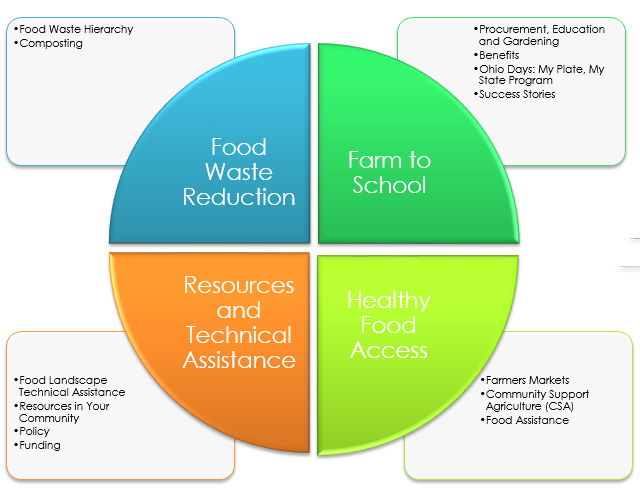 Farm to School is a community based strategy that focuses on creating a healthy school food environment. Programming activities provide a variety of benefits to students, parents, schools, communities and food producers. The following highlights some of those benefits and how we can strategically work together in Central Ohio across many sectors. Kids win! Farmers win! Communities win! Farm to School provides kids access to nutritious, high quality local foods while serving as a financial opportunity for farmers and producers within your community. This community based food systems approach shortens the distance between farms to tables. Buying local supports the local economy and reduces the carbon footprint of transportation. These aspects create a healthy environment within and around our schools and benefit our children’s future! 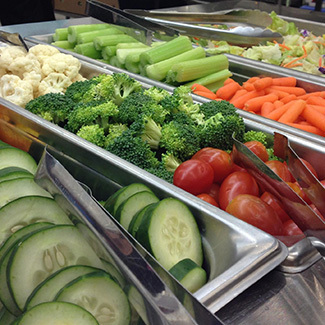 The school is an ideal environment to establish healthy eating habits among children and it is also a critical time in a child’s life to address childhood hunger and obesity prevention. Many children consume most of their daily calories in school and are relying upon their school to create a healthy environment. Farm to School activities can increase a child’s willingness to try new foods and continue on the path to healthy eating throughout their lifetime. Evidence shows that farm to school participation contributes to choosing healthier options at school meals, consuming more fruits and vegetables at school meals and at home, reduced screen time and increased physical activity. Communities as a whole can benefit from this program because families are learning how food is grown and how it affects their health and wellness. It is well known that healthy learners are better learners. From experiential learning in the garden to taste-testing in the cafeteria, this increased awareness and access to healthy local foods enhances the educational experiences for students. 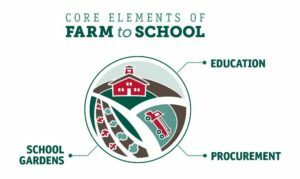 Farm to School curriculum, nutrition, sustainability and agricultural education and learning about the food system as a whole are all great strategies to enrich core subjects such as science, math and language arts. The typical produce that you purchase from the grocery store can easily travel up to 1,500 miles from the farm to its final destination on your plate. Because food is traveling long distances across the country this also impacts the way in which it is processed and the quality of the food. Have you ever bought the same product from a local farmer as you have from the grocery? Chances are the same food tastes vastly different. That’s because local food is harvested when it is supposed to be – when it is ripe. Aside from the quality of food there are also social and economic implications of food waste. School food purchasing practices coupled with education is a one way to mitigate climate change and the impact that food has on the environment. 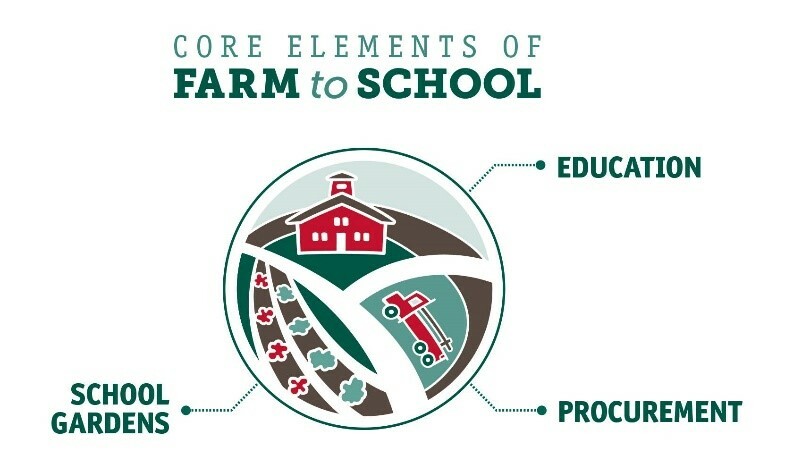 Farm to School programs help support the local economy with awareness being the first step of support. Increased interest in purchasing local products helps provide business to local farmers and stimulate the local economy. Research shows that Farm to school programs lead to job creation and maintenance and improve household food security.